Where are we? Where do we want to go and how to get there? Our research group is interested in spatial navigation and memory. We use rodents as an animal model. Like humans, rodents can flexibly navigate in their environment, taking shortcuts or making detours if needed to reach their goal. This ability is thought to rely on an internal cognitive map. 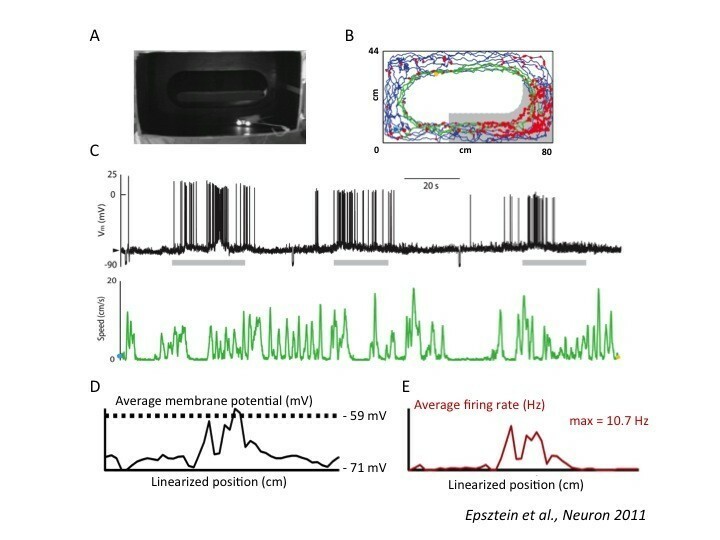 The activity of principal cells in the hippocampal formation is strikingly modulated by the position and orientation of an animal in its environment. Place cells in the hippocampus fire when an animal is in specific positions in its environment, grid cells in the entorhinal cortex fire when animals are at the crossings of a hexagonal grid covering the all environment and head direction cells fire when the animal’s head point towards a specific direction. Altogether, these cells could provide a neuronal substrate for the cognitive map. Despite decades of research, which sensory information is important to activate place cells and whether all places are coded at a similar spatial resolution is unclear. 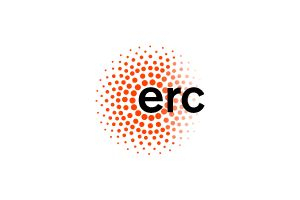 To address this question we recently developed multi-shank silicon probe recordings in head-fixed mice navigating virtual reality environments (Bourboulou, Marti et al., 2019). Virtual reality allows a good control of the sensory cues available to an animal to orient itself while multi-shank silicon probe allow the recording of hundreds of cells simultaneously. Finally, at the single cell level we use whole-cell patch-clamp recordings in vivo in navigating animals (Lee, Epsztein and Brecht 2009; Epsztein, Lee et al., 2010; Epsztein et al., 2011) to probe how intrinsic and synaptic cellular properties determine the involvement of single cells in spatial information coding. Altogether, this work could help us understand the formation of memory in general and the spatial orientation deficits observed in several pathologies such as temporal lobe epilepsy, attention deficits or Alzheimer’s disease. 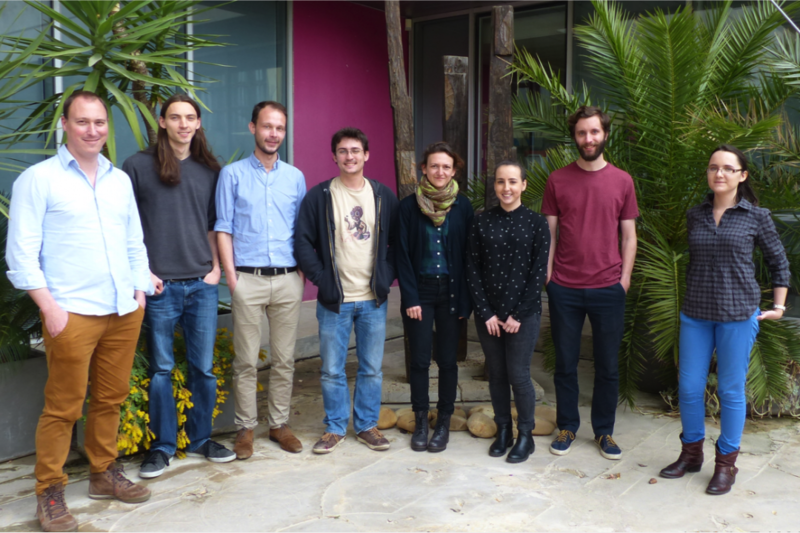 The Epsztein lab in 2016: (from left to right) Jérôme Epsztein, Peter Morgan, Romain Bourboulou, François-Xavier Michon, Julie Koenig, Caroline Filippi, David Micinski, Marion Le Mao. Missing: Geoffrey Marti. A Top view of the maze. Animal position in the maze is determined by light emitting diodes. B. Trajectory of the animal in the environment (blue line) during the intracellular recording of a CA1 pyramidal cell. Red dots indicate animal position when the cell fires spikes. Most of the spikes occur when the animal is in the lower right part of the maze (grey shaded area). C. Membrane potential (black trace) and instantaneous speed of the animal (green trace) during three successive laps around the maze (green path in B). The cell fires at high frequency each time the animal crosses the grey shaded area (grey bars under the trace). This neuron is thus a place cell coding for the grey shaded area of this particular maze. D. Average membrane potential of the same cell over all laps around the maze in one direction plotted against the linearized position of the animal in the maze. We see a large bump or hill in the membrane potential at the location for the cell’s place field but not elsewhere in the maze. E. Same as in D for spiking activity. Dynamic control of hippocampal spatial coding resolution by local visual cues. Intracellular determinants of hippocampal cell assembly formation during associative learning. 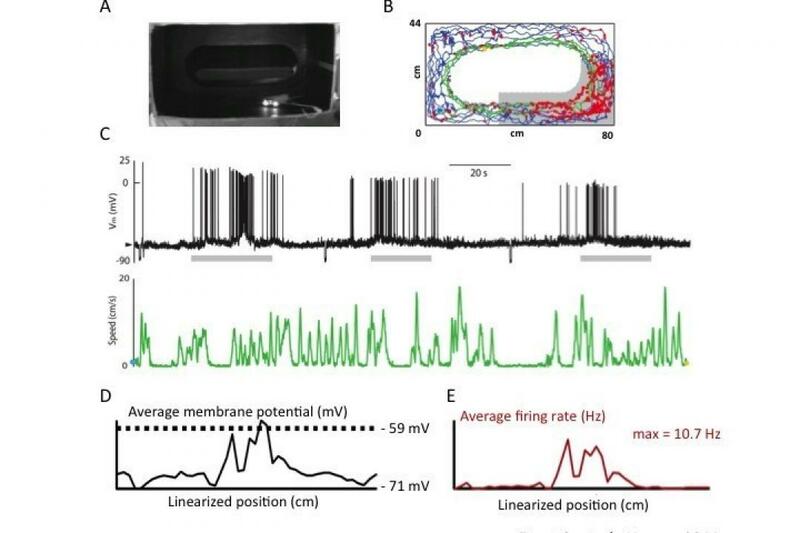 Abnormal UP/DOWN Membrane Potential Dynamics Coupled with the Neocortical Slow Oscillation in Dentate Granule Cells during the Latent Phase of Temporal Lobe Epilepsy. Whole-cell patch-clamp recordings in freely moving animals. New and distinct hippocampal place codes are generated in a new environment during septal inactivation. Parallel and convergent processing in grid cell, head-direction cell, boundary cell, and place cell networks. Contribution of aberrant GluK2-containing kainate receptors to chronic seizures in temporal lobe epilepsy. Intracellular determinants of hippocampal CA1 place and silent cell activity in a novel environment. The spatial periodicity of grid cells is not sustained during reduced theta oscillations. Impact of spikelets on hippocampal CA1 pyramidal cell activity during spatial exploration. Head-anchored whole-cell recordings in freely moving rats. Electrophysiological recordings from behaving animals--going beyond spikes.